Tammy Jordan, President of Fruits of Labor, is the founder of Seeds of Recovery, a West Virginia culinary and agricultural training program focused on holistic healing and career development for women recovering from drug addiction. The program draws on Nourish films and learning activities to open meaningful conversations and support healthy lifestyles. Because food touches our lives in such intimate ways, it provides fertile soil for a program like Seeds of Recovery, which works with the whole person. 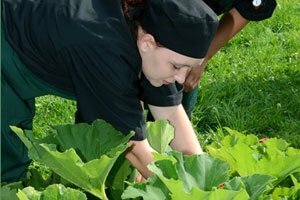 During the multi-week program, our students visit the Fruit’s of Labor farm and learn about harvesting fruits and vegetables. Then, they venture into the kitchen to learn how to turn their freshly picked produce into delicious dishes and baked goods. The Nourish Curriculum complements these hands-on activities by facilitating deeper discussion around the concepts of local and seasonal food, healthy eating, and the principles of sustainability. Participants begin to connect “real food” with their personal health and the health of their families and community. Many women comment on how much better they feel eating fresh, local food compared to fast food. During each session, the students view several of the Nourish short films and participate in an experiential activity, such as fruit and vegetable tastings. The Nourish videos spark lively discussions and inspire students to consider new foods. Many participants, for example, were excited to start growing herbs at home after watching the short film, “Herbs,” featuring British chef Jamie Oliver. Seeds of Recovery also uses the Nourish activity Food Traditions, which evokes wonderful family memories from a time before the challenges of addiction. The activity helps the women to reconnect with family members and opens a dialogue at home that is positive and life affirming.This simple Nourish activity has an amazing effect on both the students and their families.